Would half a water bond sell better to voters than the full $11 billion bond scheduled to be on the ballot in November? That’s what’s now before the California Legislature in a new proposal from Gov. Jerry Brown. In 2009 the Legislature passed Assembly Bill 29, the Safe, Clean Reliable Drinking Water Supply Act, authorizing an $11 billion general obligation bond that excluded any new dams for water storage. The bond would need to be approved by two-thirds of voters. The Legislature pulled the bond from 2010 and 2012 ballots over concerns voters would balk at its size and excessive earmarking during the recession. Any new water bond must pass both houses of the Legislature and be signed by the Governor by June 26, 2014 — today — or it will not be placed on the November ballot. Democratic senators want a larger bond without tunnels, while Republicans wanted the tunnels included. But Brown gave neither side what it totally wanted by cutting down the bond’s size from $10.5 billion to $6 billion and saying he wanted a “tunnel neutral” bond. Since the Twin Tunnels and the Bay Delta Conservation Plan are linked, a tunnel-less bond is also likely to end up a “fish-less” bond as well. The Twin Tunnels is a plan to convey water underneath the Sacramento Delta to southerly farms and cities in two huge tunnels. 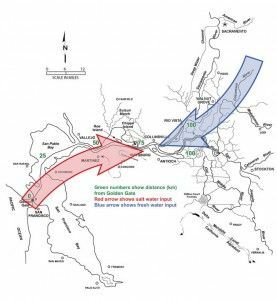 Today the Delta has to mix southerly water flows to farms and cities with northerly water flows for salmon to migrate to the ocean. The Delta has thus become dysfunctional because it cannot do both unless someone can devise a system where water can flow in opposite directions at the same time. That is what the Twin Tunnels would do. Salmon are anadromus fish (swimming up rivers to breed) that are born in mountain fresh water streams and migrate to ocean salt water, then return to fresh water again to spawn. Will California voters pass a new water bond? What will be the size of the new water bond? What would be California’s water supply situation without the tunnels? Should any new water bond include new dams for water storage? Even Gov. Brown’s downsizing of the bond to $6 billion wouldn’t likely gain voter approval with or without the tunnels or the fish-flow improvements. Smith says the crucial factor in approval of bonds by voters is the amount of state debt burden. While Brown touts a balanced state budget, his budget only partly deals with an $80 billion deficit in the California State Teachers’ Retirement Fund, let alone other huge pension and unfunded retiree health care costs. Another issue is the typical understating of true costs of large capital projects, especially bottomless environmental projects. According to Smith, without the tunnels, California would be facing a very high cost of $1,000 per acre-foot for unreliable, untreated water. At that cost, it would be better off to stop pursuing the tunnels and think about local alternatives for water resources development. He added that a water storage component should be included in any new water bond to increase the reliability of water deliveries, especially during drought years. Will CA pass a Water Bond? If new water storage is retained in any new bond, there still is a way to convey water south to farms and cities in the existing State Water Project without any new tunnels. Voters are ultimately unlikely to pass any water bond unless the state’s long-term debt situation improves. However, the newly released U.S. Gross Domestic Product data might spell doom for any water bond. The first quarter of 2014 saw the national economy shrank by 2.9 percent, mainly due to Obamacare costs. Two consecutive quarters of GDP decline indicate a recession. Assuming a water bond is put on the ballot by the Legislature and governor today, by November we will know whether we are in another recession and whether we will have a water bond. Inevitable…..California needs annual improvements in water resources managed and fully funded to cure past whacko’s mistakes and to meet population growth projections. LA, SD, SF are in standard of living decline. New growth areas are emerging. Young people cannot afford homes and lifestyles in toilet bowl aged cities. So……we need lots more water. Kill the Brown Streak and invest the money into new dam construction. We need more water storage, it’s not that difficult. Tell the greenies to stuff it.